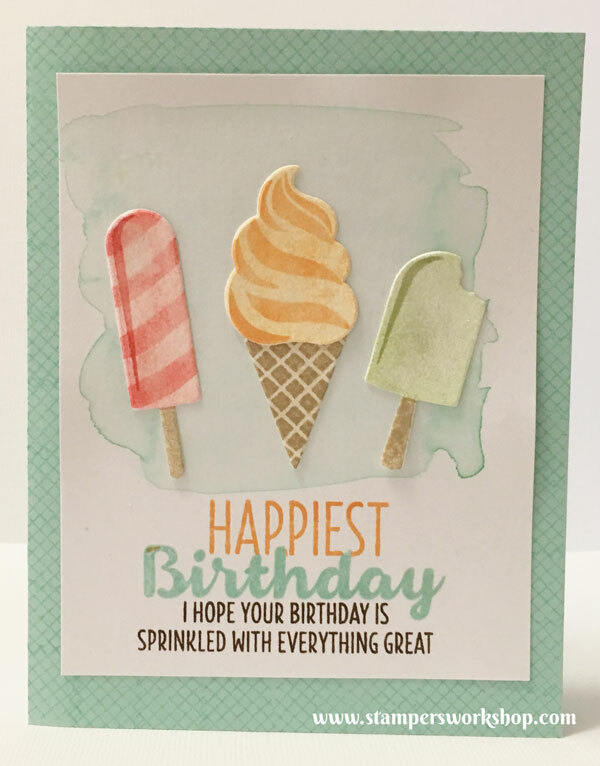 A very quick and simple card to share today using the Cool Treats bundle, once again, from the Occasions catalogue. As you can tell I love this set! A little trick for spacing the ice cream evenly is to use a piece of Press’n Seal by Glad. Simply space the images across the card. When you are happy with how it looks, take a piece of Press’n Seal and lay it over the top. This will grab the images. Lift up. Add adhesive to the images and press them down again. Rub over the images to ensure they are stuck in place and gently remove the Press’n Seal. Voila! They are exactly where you placed them! 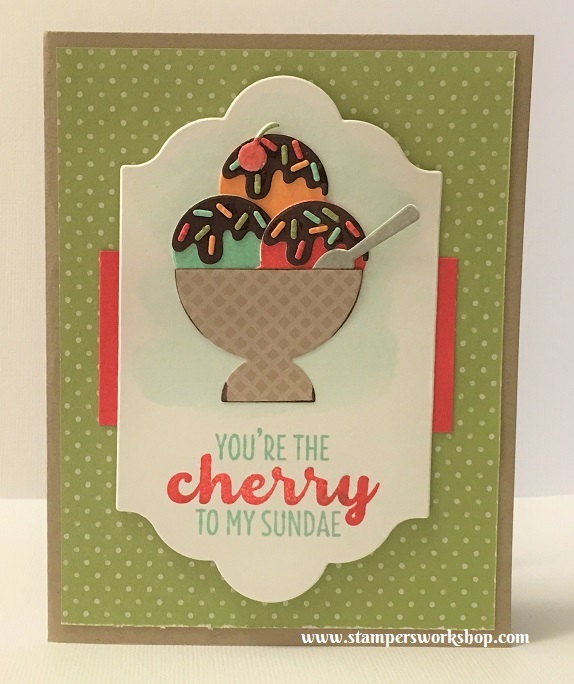 Materials used: Stamps – Cool Treats; Dies – Frozen Treats Framelits, Lots of Labels Framelits; Cardstock – Crumb Cake, Whisper White; and Stamp Pads – Chocolate Chip, Crumb Cake, Peekaboo Peach, Pool Party, Watermelon Wonder. Thanks for stopping by today! 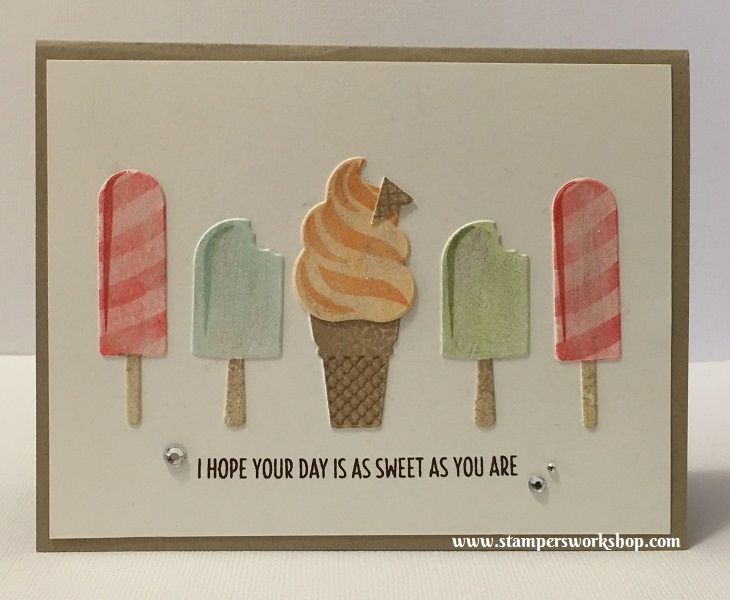 If you are interested in any of the items used to create this card, please visit my online shop at www.stampersworkshop.stampinup.net. Don’t forget Sale-A-Bration is still on – only a few days remain! The Cool Treats stamp set and framelits die bundle remains one of my favourite bundles in the Occasions catalogue (pages 32-33). The card I am sharing today uses products from this bundle and the coordinating Designer Series Paper. It is a simple card design. The only really fiddly bit was putting all the sprinkles on the top of the ice cream (and I’m sorry if you now want ice cream! lol). 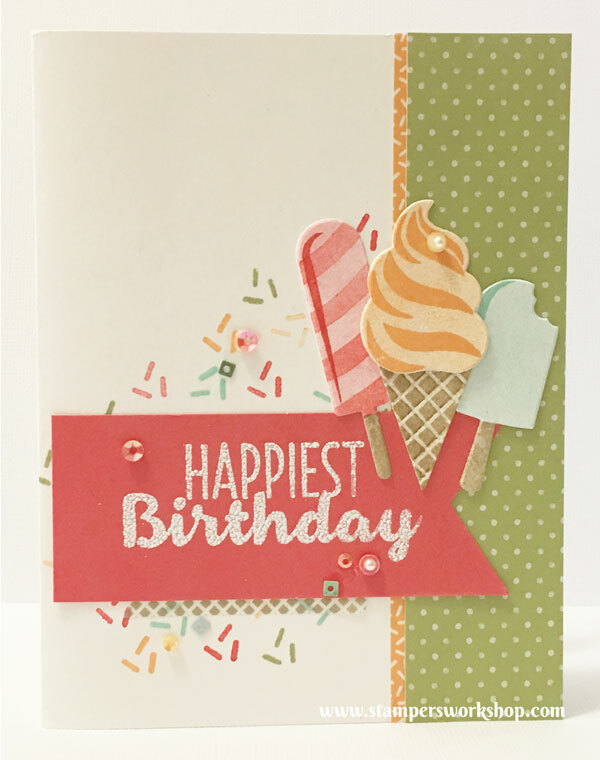 Materials used: Stamps – Cool Treats; Dies – Frozen Treats Framelits, Lots of Labels Framelits; Designer Paper – Tasty Treats Specialty Designer Paper; Cardstock – Crumb Cake, Whisper White; and Stamp Pads – Chocolate Chip, Crumb Cake, Peekaboo Peach, Pool Party, Watermelon Wonder. 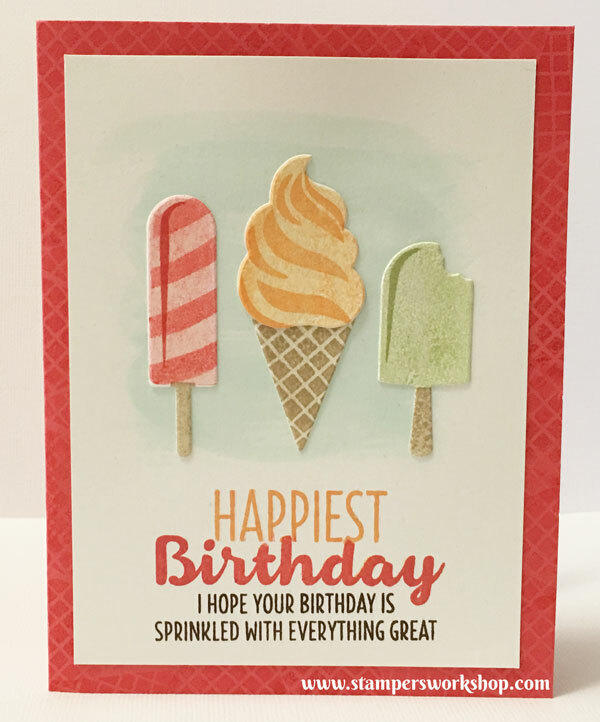 If you would like to make your own version of this card, please visit my online store (www.stampersworkshop.stampinup.com) to purchase the items you need. Don’t forget Sale-A-Bration is still happening (until the 31st March, 2017) so every qualifying order of A$90.00 or more will enable you to choose a free item from the Sale-A-Bration catalogues. It is also the perfect time to join Stampin’ Up!. If you would like to discuss this with me, please send me a message and I’d be happy to talk to you about it. More information about joining Stampin’ Up! can be found here. Are you all loving the new Occasions catalogue? I am! So many things to inspire. I have made quite a number of cards using the Cool Treats Suite and I’ll be sharing more of them over the coming weeks. For the cards below, I have stuck with the colour scheme featured in the catalogue (Chocolate Chip, Crumb Cake, Pear Pizzazz, Peakaboo Peach, Pool Party, and Watermelon Wonder). You don’t have to, of course! The main reason I did was because I stamped up a whole pile of images in one go and decided it would be best to have them match the Tasty Treats Specialty Designer Series Paper. Once again I am sharing two designs which are VERY similar. All that I have changed is the dominant colour and I’ve angled the ice creams. I’d love to know which design you prefer. Can you spy the texture of the card background? All I did to create this was stamp the cone stamp repeatedly over the background. 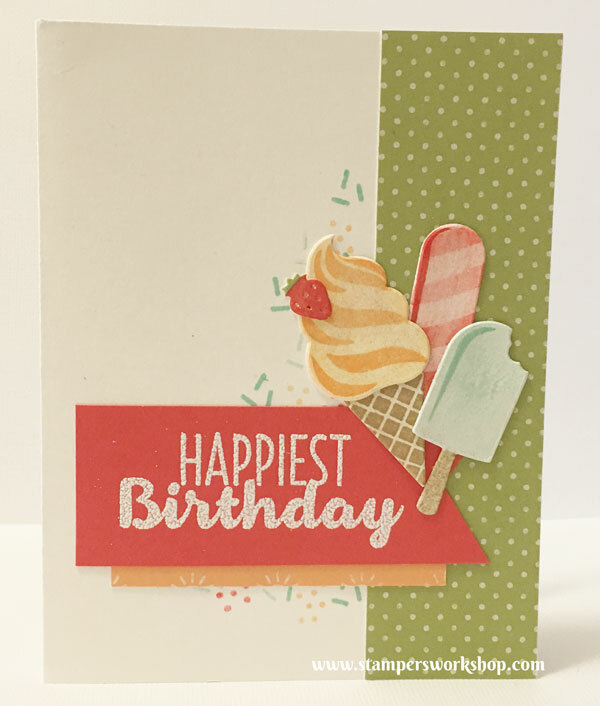 I used Watermelon Wonder so it tied nicely with the card itself – not too overpowering. The blue watercolour on the main panel is just Pool Party watered down and swiped over the cardstock. Don’t be too heavy handed as it is not watercolour paper. You don’t want it to pill or ruin the cardstock. A little bit of water is fine though! Now while I liked this card design, I thought I might change it up a little. The use of Pool Paper really gives it a different look. Once again I used one of the cones stamp to give the cardstock a look of texture. This time I decided to angle the ice creams too. So can you tell which one is my favourite? I have to say that it is the second one. This type of card is super simple to create but it looks so cute! If you stamp up a lot of images at the one time you can relatively quickly create a whole set of cards ready for when you need them. Don’t forget there is still time to take advantage of the Sale-A-Bration promotion! For every $90 AUD you spend (before shipping), you get a FREE Sale-A-Bration product. And who doesn’t like free stamping supplies?! 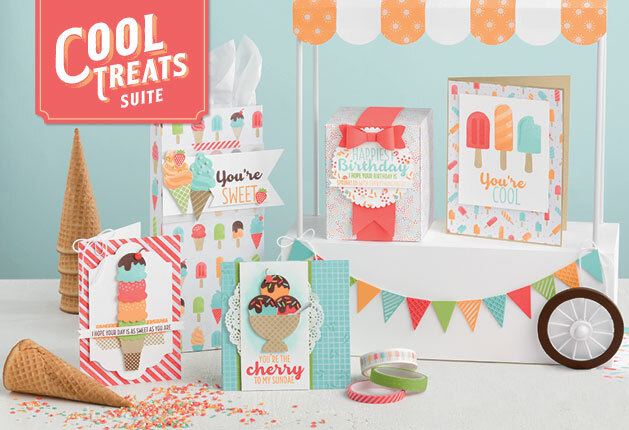 Cool Treats suite is one of my favourite suites in the new Stampin’ Up! Occasions catalogue. It can be found on pages 32-33 in the Australian catalogue. I love the colours used for the papers (Chocolate Chip, Crumb Cake, Pear Pizzazz, Peekaboo Peach, Pool Party, Watermelon Wonder and Whisper White). And the stamps- wow, the two step stamping really gives a dimensional look which is lovely. Plus some of the sentiments can be used with other sets – they aren’t restricted to the one set. Love this! Today I am sharing three cards which are VERY similar. The reason I am sharing all three is that I wanted to show you how you can slightly change up a design depending on what items you have at your disposal. 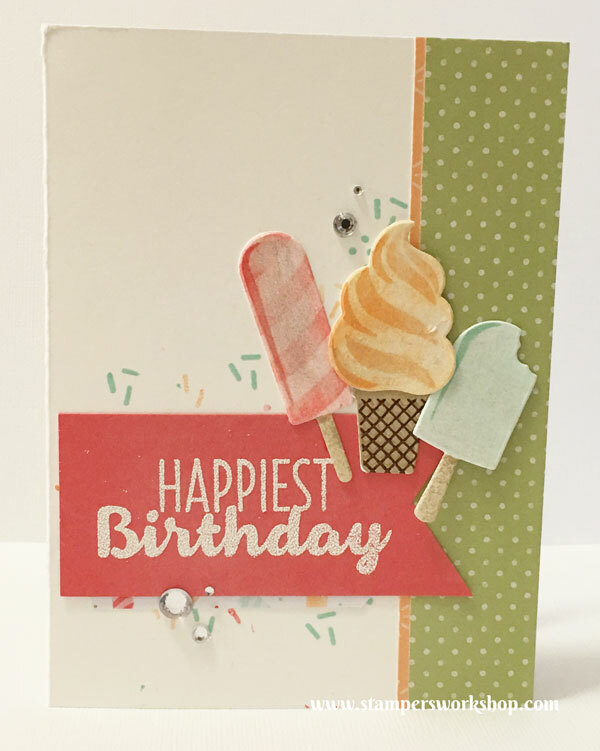 This card design is one which was originally shared by Stampin’ Up! to demonstrators and I just *loved* it! I wanted to re-create it as soon as I saw it. For this card, I stamped up the images, added a strip of paper to the right hand side of the card and a small strip just under the sentiment. It’s a very simple card. For the second card, I added another strip of paper to the right hand of the card just to give it a little more interest. Then I added a few more rhinestones, because who doesn’t like a little bling? For the last card I decided I really needed to invest in the coordinating Tasty Treats Designer Washi Tape and the Sprinkles Embellishments to see if it would really lift the card that bit further. So there’s three cards – almost the same, but slightly different. I think my favourite is the second one…although I do love the shape and texture of the cone in the third one. Which one is your favourite? Should you be interested in purchasing this suite (or parts of it) for your own use, please visit my store at Stampers Workshop. And don’t forget to take advantage of all the Sale-A-Bration offers!